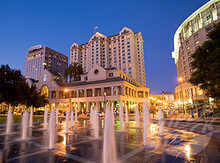 The Fairmont San Jose is where heads of state and royalty stay when they visit the San Jose area. It's the region's finest hotel. You'll remember the glow of elegance and impeccable service long after your stay at the San Jose Fairmont Hotel. With the meteoric growth of the computer industry, Silicon Valley has become one of the world's busiest hubs, and the capital of this high-tech mecca is San Jose. 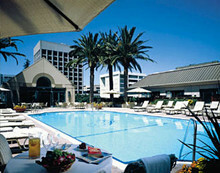 The Fairmont San Jose combines technological innovation with timeless elegance. Meeting and conference rooms are equipped to handle functions from exquisite receptions to multimedia presentations. A short drive will take you to 30 wineries and the famous Monterey Peninsula golf courses. In the heart of northern California's largest city, The Fairmont San Jose blends historic grandeur with all the high-tech excitement of Silicon Valley. Located in San Jose's Historic Downtown, The Fairmont is the perfect location for any visit to the Monterey / San Francisco Bay Area. Each guest room and suite is luxuriously appointed with amenities such as terry cloth robes, the finest bedding and fragrant bath products. Amenities including individual climate control, cable TV with in-room pay movies and mini-bars are in each room. Refrigerators, CD players and rollaway beds are available upon request. Well-equipped for business travelers, The Fairmont San Jose offers an executive business center and high-speed internet access, dataport and multi-line phone with voicemail in each room. From floor to ceiling, everything is designed to maximize the comfort of guests during their stay at the Fairmont Hotel. A standout among San Jose hotels, and among luxury hotels throughout Silicon Valley, The Fairmont offers attentive bell, concierge and housekeeping services as well as valet parking, a pet policy, laundry service and wheelchair accessibility. By request, guests will be furnished with a list of local babysitting services and cribs equipped with complimentary diapers, baby bottle, pacifier, baby powder, baby lotion, baby shampoo, thermometer, small soft towel and a cuddly ‘Fairmont Bear.’ On-site dining options at The Fairmont’s Fountain Restaurant, Pagoda Restaurant and Bamboo Lounge and Fairmont Express Café offer guests the opportunity to grab a quick espresso, sit down to a luxurious Chinese meal or dig in to a succulent steak. With a fully equipped fitness center, day spa and rooftop pool, The Fairmont is the perfect Silicon Valley luxury hotel to recreate and relax. Passing through the glass doors means entering a world of luxury. The Fairmont employs more than 400 staff members who do everything they can to ensure that guests are swaddled in comfort. The 20-story, two-tower building has become an iconic part of the San Jose skyline, and inside, the awesome Lobby Lounge and Fountains Restaurant make the place a downtown destination. With more than 800 guest rooms, this luxury hotel has become a popular destination for tourists, but it can mean a sweet weekend for locals too.